Fruitless Pursuits: El Professore Movie Reviews: Zero Hour! Way back around 1989, I caught a documentary on the Zucker Brothers. It was to coincide with the theatrical release of 'Naked Gun 2 1/2 - The Smell of Fear' and featured lengthy interviews with the Zuckers as they discussed each of their films and shows in length (among other things, I discovered that 'Police Squad' was a riff on an old show called 'M-Squad' which starred Lee Marvin). When they got to 'Airplane! ', I assumed that they would cite the 'Airport' series as it's inspiration. 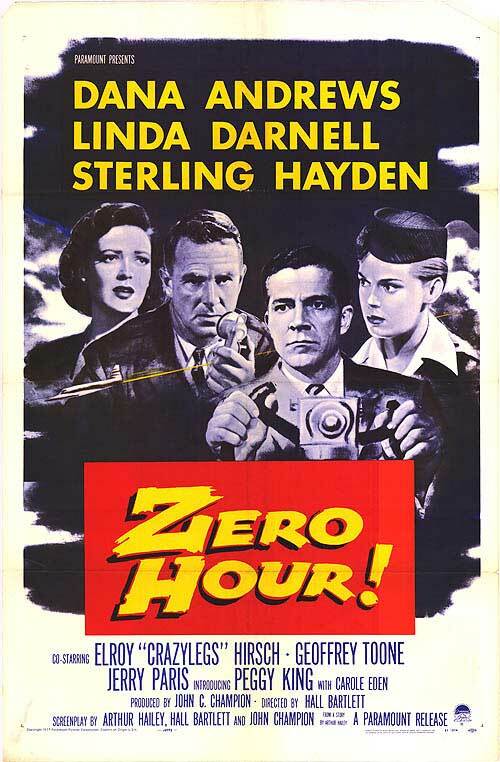 Instead, I was surprised to hear them talk about this practically unknown 1957 film called 'Zero Hour' (which they videotaped off T.V. one night after taping something else; purely a coincindence that they happened upon it). They found the film unintentionally hilarious and couldn't resist the idea of remaking it. It wasn't until around 2004 that I finally landed a copy of this (at the time) obscurity. I was stunned; 'Zero Hour' literally IS 'Airplane' minus the punchlines! To give a detailed plot rundown would be senseless. If you know the plot of 'Airplane', then you know the plot of 'Zero Hour'. All the characters are there; the tortured ex fighter pilot with WW2 flashbacks who has to land the plain when food poisoning claims both pilots, his estranged wife, the doctor, the little kid who gets a tour of the cockpit. Watching this movie is like stumbling into some sort of bizarro universe where a famous comedy is instead an obscure drama. One of the things that struck me about it was the cast, all well known actors of the time and all noted for doing high quality work, yet appearing in this increasingly silly prototype of the '70s disaster genre. Dana Andrews (the original Ted Stryker) was one of the most prestegious actors of the '40s and '50s, starring in numerous dramas, westerns and film noir. In 1957, he starred in Night of the Demon (aka Curse of the Demon) which is easily one of my favorite horror films of all time. Linda Darnell was a top '40s bombshell/starlet who by the time this film was made, had developed into an almost matronly prescence. For me, the top chops go to Sterling Hayden (Gen. Jack Ripper in 'Dr. Strangelove' among others). As strong and sturdy as Robert Stack was in 'Airplane', he can't hold a candle Hayden and his unmistakeable voice. Overall, I give 'Zero Hour' three stars, but I'm not certain I'd give it this high of a rating if it weren't for 'Airplane's' existence. I'll probably never know since it's impossible for me to seperate the two. Would make for an interesting double feature, that's for sure.